Review: Finding a Parsi Cookbook that has a true treasure trove of great recipes coupled with the authenticity of home cooking is really hard. Rita Jamshed Kapadia has successfully achieved both in this book. Back in December 2016, I happen to luckily attend one of her book tour events and had the joy to first try out some of her (free:)) dishes at the event, immediately bought her book followed by preparing many dishes. Many of the dishes such as Persian Jeweled Rice, Prawn Temperdo, Dar ni Pori, etc. have now become an integral part of our menu. So far the book has been more than sufficient to follow the recopies but the fact that I can reach out to the author for any questions is super comforting. I highly recommend this book to anyone interested in learning about parsi cooking. Home ⁄ Z Fundraiser ⁄ 11WZC ⁄ Parsi Cuisine Cookbooks, eBooks on Amazon ⁄ Review: Finding a Parsi Cookbook that has a true treasure trove of great recipes coupled with the authenticity of home cooking is really hard. Rita Jamshed Kapadia has successfully achieved both in this book. Back in December 2016, I happen to luckily attend one of her book tour events and had the joy to first try out some of her (free:)) dishes at the event, immediately bought her book followed by preparing many dishes. Many of the dishes such as Persian Jeweled Rice, Prawn Temperdo, Dar ni Pori, etc. have now become an integral part of our menu. So far the book has been more than sufficient to follow the recopies but the fact that I can reach out to the author for any questions is super comforting. 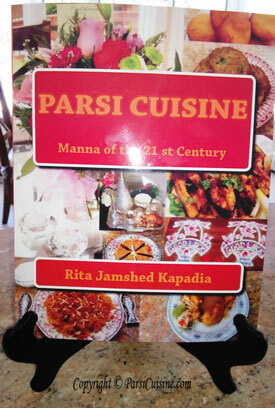 I highly recommend this book to anyone interested in learning about parsi cooking.